Not being a physi­cist, I don’t rightly know how a hard hat will help. It is prob­a­bly like a super-​hat. I love the cring­ing glasses! Hey thanks! I’ve been trying to sell the patent to LensCrafters, but they just don’t under­stand the poten­tial of dynam­i­cally expres­sive eye­wear. 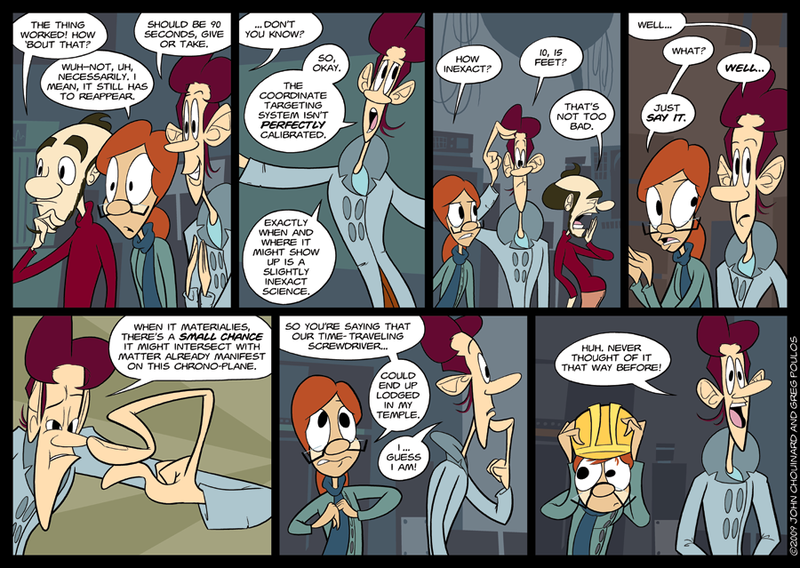 After read­ing the entire comic and read­ing your com­ment just now, John, I think I’m in love. John is emi­nently, entirely, and empir­i­cally irre­sistible. I’ve always sus­pected it’s his mag­is­te­r­ial facial hair that does it. Why does Milo have 4 joints in his finger?? Just kid­ding, this comic is amaz­ing!